You can shield your home from the harsh winters in Greenwood Village, Colorado by partnering with Scottish Home Improvements. As your siding contractor, we can show you how certain siding could help lower your energy costs and cut down on the required maintenance on your home. You’ll see why Scottish Home Improvements has been such a popular choice for years, not just in Greenwood Village, but all over the state of Colorado. Many Greenwood Village, Colorado residents have discovered James Hardie® Fiber Cement Siding, which is one of the most durable home siding choices you can make. This material rarely needs maintenance, and unlike vinyl, it resists cracking and splintering in the freezing temperatures. James Hardie backs its ColorPlus® products with a 30-year limited product warranty and a 15-year limited finish warranty that covers both paint and labor. Because James Hardie products with ColorPlus® Technology are manufactured to be dimensionally stable, paint stays on the boards longer meaning less maintenance for you. When installed properly with HardieWrap® weather barrier and rigid foam, fiber cement siding is an incredible insulator, and you’ll see lower heating bills during even the coldest months. James Hardie® Fiber Cement Siding can also be crafted to match the current exterior of your home, so making the switch could be even easier than you thought possible. Or, if you prefer, we can help you design a new, fresh look for your home. This product has literally thousands of color and style combinations, and our team will help you each step of the way through designing and installing your new siding. You can also seek out James Hardie® Vertical Panel stucco styled siding for your home. This is a beautiful alternative to traditional stucco, and it will last much longer because it resists the cracking and chipping that plagues typical stucco finishes. For your business, Scottish Home Improvements can provide steel siding. Though steel siding lacks the aesthetic value necessary for your home, it can definitely protect your commercial spaces from the elements. This can lower your annual maintenance costs and give you peace of mind knowing that your business is protected. If you are looking for a cedar siding aesthetic for your home, Scottish Home Improvements can help you create that look with either the James Hardie® Fiber Cement Cedarmill finish or natural cedar siding. The James Hardie® Cedarmill finish requires no maintenance and provides the same beauty and durability as the rest of their fiber cement products while still creating a beautiful cedar appearance. Natural cedar siding comes with more maintenance, but for homeowners who don’t mind painting and staining their siding regularly, natural cedar siding is a truly authentic and timeless look for your home. Stone is another natural and unique option for your Greenwood Village home’s exterior. We offer a huge selection of stone varieties, and whether you want a full stone finish or just a few stone accents, our designers will help you create the perfect look for your home. Scottish Home Improvements is also proud to offer siding repair for home and business owners in Greenwood Village, Colorado. 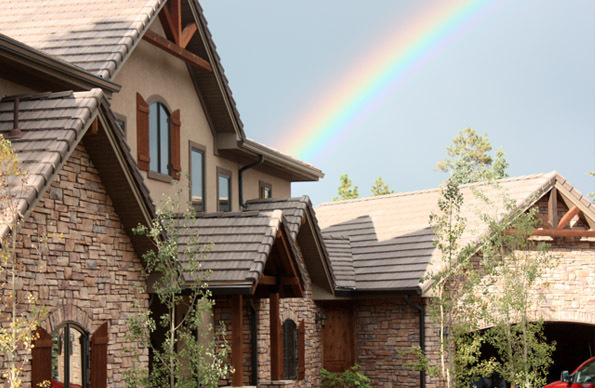 Colorado’s extreme weather variances, especially hail, can wreak havoc on your siding, and with our wide range of knowledge and experience, you can trust Scottish Home Improvements to fix it. We have completed many different siding repair projects, and with our huge inventory of siding products, we can match repairs to even faded or discontinued siding styles. Our company holds an A+ rating with the Better Business Bureau and a gold star for great customer service, which means you can feel comfortable putting your project, and this big investment, in our hands. Feel free to browse this site to learn even more about our many siding options for Greenwood Village and all of Colorado. No matter what kind of siding you’re interested in, and no matter what budget you would like to stay within, the expert team at Scottish Home Improvements can build something you’ll love. Give us a call or send us an email if you have any questions about adding new siding to your home or if you would like to set up your on-site consultation today!